Enjoy beautiful Tucson winter weather with temperatures at the start averaging in the high 30s (F) and reaching 65-70F by 11 a.m. This is a very scenic, mostly downhill, half marathon course in northern Tucson. Due to safety requirements, there will once again be a ‘wave’ start for the Damascus Bakeries Half Marathon. (Participants will receive both a “chip time” and “gun time” after finishing the event. Competitors aiming for a podium spot in the Tucson Half-Marathon should opt to be near the starting line, (in the first corral as winners times will be based on “gun time” only.) Runners will be released in groups of 200 approximately every 2 minutes. Thank you for your patience and cooperation on race morning! **No race day registration or packet pick-up available. Baby Joggers/Strollers are not allowed on the course. The Half Marathon course closes at 1:30 p.m. Course cut offs will be enforced and are posted below. The Half Marathon course will start on the Biosphere Road and finish at the Golder Ranch Fire Station on Golder Ranch Road in the Town of Catalina. The half-marathon course is scenic, fast, primarily downhill (with some rolling hills around mile 11) and certified by USATF (#AZ16023JOE). The half-marathon follows the last 13.1 miles of the Tucson Marathon course. You’ll truly enjoy this fun, scenic race. HALF MARATHON PACE TEAMS: Pace Teams for the Damascus Bakeries Tucson Half Marathon will be provided by Beast Pacing. Confirmed pace groups for the 2018 events (as of 12/1/18) are: 1:40 / 1:50 / 2:00 / 2:10 / 2:20 / 2:30 / 2:45 / 3:00. Be sure check back in the days leading up to the race for final confirmation on these times. Please keep in mind that this is an all-volunteer team and occasionally a group leader may not be able to make it on race day. We apologize if your goal time is not offered. PARTICIPANT TRACKING: looking to track a runner on race day? CLICK HERE to register for this service, which is provided by Chronotrack. For the safety of everyone, all competitors must stay inside of the safety cones at all times. Anyone who runs outside of the safety cones will be disqualified. NO EXCEPTIONS! As stated above, BABY JOGGERS/STROLLERS are NOT allowed on the course at any time. The Tucson Marathon & Half -Marathon Expo will be held on Friday, December 7th (9:00am - 7:00pm) at the Hilton Tucson El Conquistador, 10000 N. Oracle Rd. Race packet pick-up and walk-in registration will be available. We strongly recommend that all runners access these PDF docs on the web site, and fully familiarize themselves with any/all details in advance of race weekend. REGISTRATION CONFIRMATION: Looking to confirm your registration? Please CLICK HERE and provide the information requested on the page. LOOKING TO CHANGE RACES? If you need to switch races, please CLICK HERE and follow the instructions listed on the page. Aid Stations, with water and Gatorade, for the Half-Marathon will be located at the following points on the course: Start, 2.0mi, 3.6 mi, 5.8 mi, 6.8mi, 7.9mi, 8.8mi, 9.8mi, 10.9mi, 12.0mi, Finish Line.  Gatorade’s Endurance Formula (Lemon-Lime) is the official on-course sports drink of the Tuscon Marathon, Half Marathon, and Marathon Relay and will be available at the above aid station locations. As part of a five-electrolyte blend of sodium, potassium, calcium, magnesium and chloride, Gatorade Endurance Formula is a specialized sports drink designed to help sustain hydration during prolonged training and racing when fluid and electrolyte losses can be significant. It contains nearly twice the sodium (200mg) and more than three times the potassium (90mg) of Gatorade Thirst Quencher to help sustain hydration, maintain proper fluid balance and replace the critical electrolytes lost in sweat during these occasions. 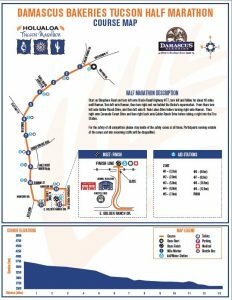 Shuttle Buses will return participants from the Finish Line (at the Golder Ranch Fire Station) to the official race parking lots and official race hotel (Hilton El Conquistador Resort). Spectator parking is not allowed at the Finish Line, at the Golder Ranch Fire Station, which is shared with the Marathon. (Vehicles parked overnight at the Golder Ranch Fire Station, on Golder Ranch Road on race day, will be ticketed and towed!) Spectators are encouraged to park at the Coronado Middle School (3401 E. Wilds Road) and take the free shuttle bus to the Finish Line, which will run every 15-2- minutes, from 8am until 1:40pm. It is a 5 minute ride from the school to the finish line. 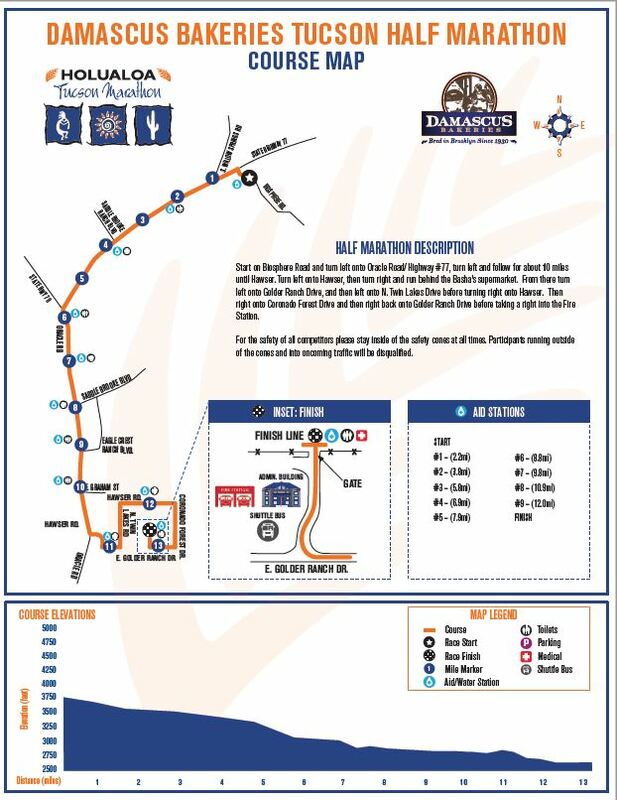 Printable Map: CLICK HERE to download a copy of the Damascus Bakeries Half Marathon map. Spectator Map: Unfortunately, there are only two decent locations on the course for spectators to view their runner. Please CLICK HERE to download a copy of the Spectator & Finish Line Parking Map. All finishers will receive a commemorative medal after crossing the finish line. Overall top male and female winners for the Full and Half Marathon races will be based on the official race (gun) time (ie: the actual order of finish). Awards will be given to the top overall male and female masters winners in the Full and Half Marathon races, based on chip time. Masters winners are not eligible for age group awards. Awards should be picked up on-site (Half Marathon after 10am; Full Marathon after 11am). Due to the fragile nature of some finisher awards, we are unable to mail certain prizes after the event so be sure to check the Results Kiosk before leaving the finish line area. RULES: The top three overall race winners, and masters winners, will receive their overall place award and forfeit any age-group award. Top three overall winners are not eligible for masters awards; the masters awards will go to the next eligible finisher. © 2019 Tucson Marathon. All rights reserved.